As you can see I am getting my humble ablog prepared for Easter! Once I put up my pastel decorations, I wanted to add an Easter recipe that would be a lovely addition to any Sunday Brunch. 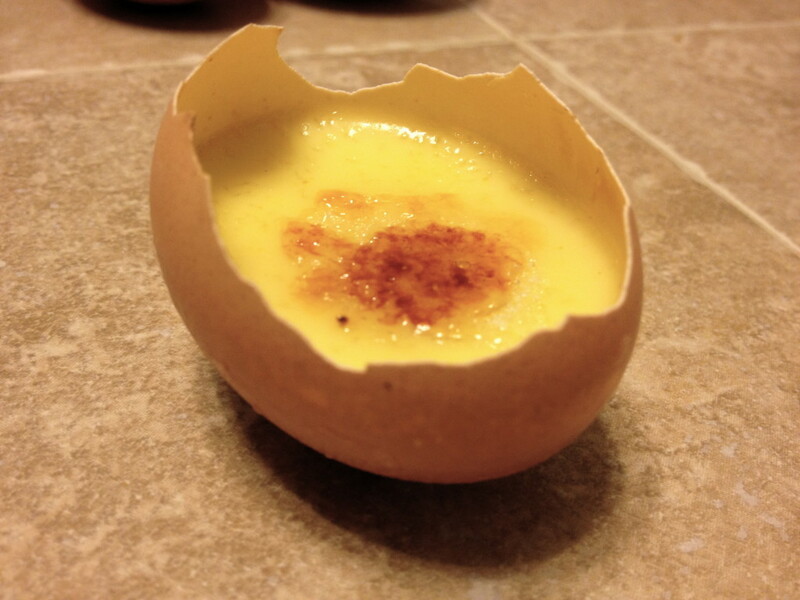 Creme Brulee is one of my favorite sweet treats. The creamy custard, topped with a crunchy, caramelized sugar is not something I have on a regular basis, so to prepare it for a holiday, I thought would be a great idea! I also wanted to serve it in a unique way. 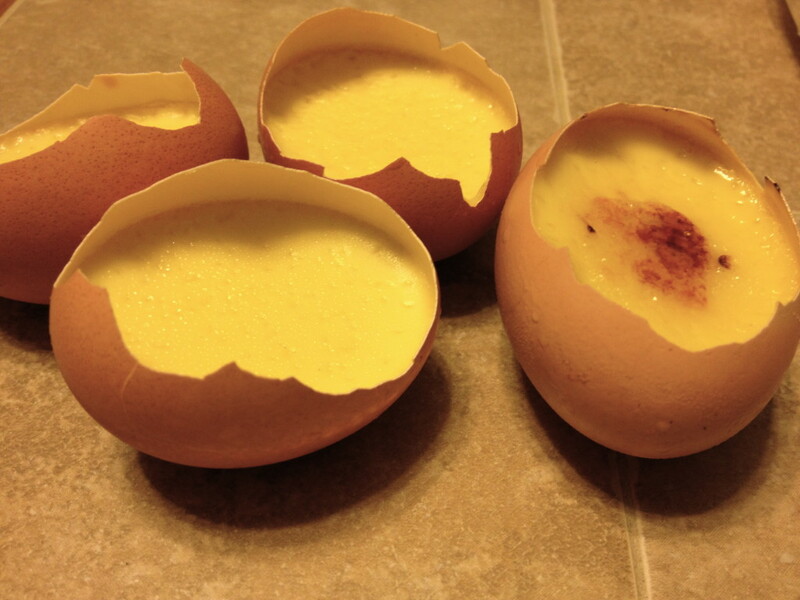 Instead of using ramekans, I thought of a whole new look to present the dessert in…eggs shells. How Easter-y! The first thing I did was choose a Creme Brulee recipe. I found that brown eggs have a little bit harder shells than white eggs, so I used those because the shell needs to be as sturdy as possible. To cut the eggs in half, I made a small whole with a sharp knife and then broke pieces away with my fingers as the guide. I think they look great with jagged edges, makes them look like a chic just hatched! 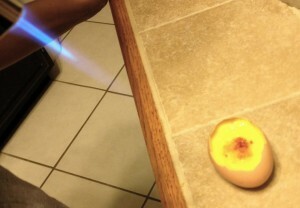 As I was breaking the shell away, I would pull the inner membrane as well. 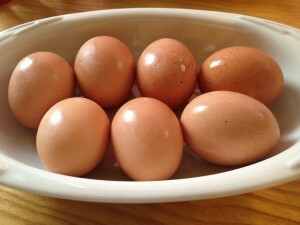 Try to save your eggs yolks if you can and reuse the egg whites for something else. Then I washed each one…very carefully! Surprisingly, the egg shells balanced perfectly. I did not have to prop them up. Next I began cooking the Creme Brulee. Set your oven to 300 degrees. Put the heavy cream and half of the 1/3 amount of sugar into a saucepan and bring to a boil. In the mean time, mix the other half of the 1/3 sugar, egg yolks and vanilla into a mixing bowl. Then you will add the heavy cream mixture to the yolks little bit, by little bit. The heavy cream will be hot, so use a ladle so as to not scramble your egg yolks. 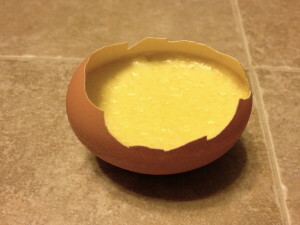 Continue mixing the entire time, then add the mixture to your egg shells. Using a muffin pan works really well for this next part. 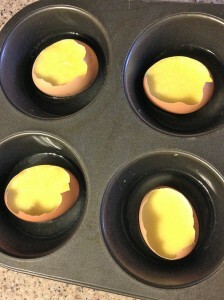 I poured a half inch of water into each hole of the muffin pan and set the egg shells inside. Bake at 300 degrees for 30-40 minutes, until the custard is solid, yet jiggly. Place in fridge for two hours. 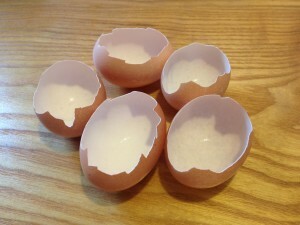 When I was ready to serve my eggs, I placed a dime’s size of sugar in the middle of each egg. 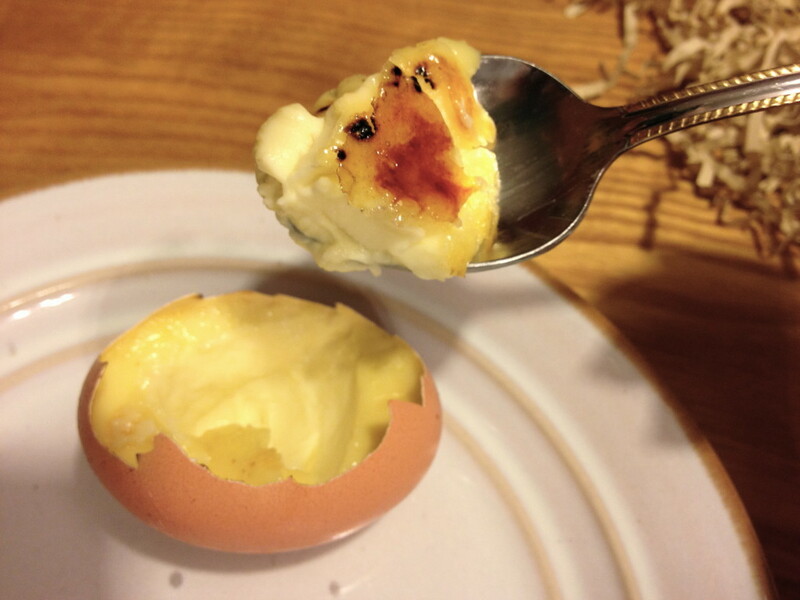 By using a creme brulee torch, I was able to caramelize the sugar specifically in that spot to give it the look of egg yolk! You will really enjoy how these come out. They are too cute for words!